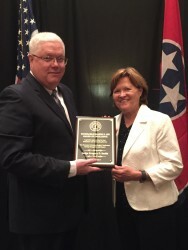 The Tennessee Municipal Judges’ Conference presented the Sharon G. Lee Award of Excellence to Judge Gregory D. Smith of Montgomery County. The award is presented each year to a municipal judge who has made a significant contribution to the Conference over the course of his or her service on the bench. It is named in honor of Tennessee Supreme Court Justice Sharon G. Lee, who served as the municipal judge in her hometown of Madisonville from 2002-2004. Judge Smith obtained his bachelor’s degree in 1985 from Middle Tennessee State University and his J.D. in 1998 from Cumberland Law School. He is an attorney in Montgomery County, Tennessee and has been the municipal judge for Pleasant View, Tennessee since 1997. Judge Smith was one of the founding members of the Conference and has been said to be the "George Washington" of the Tennessee Municipal Judges' Conference. He is often a seminar speaker and authored the Tennessee Municipal Judges Benchbook and its updates. Judge Smith served as President of the Conference from 2002- 2004, and he has continued to serve on the Board of Governors, presently as the Chair of the Long-Range Planning Committee.